5.0 out of 5 starsGirl Power on the Mountain with a side of Cute Boarder!! 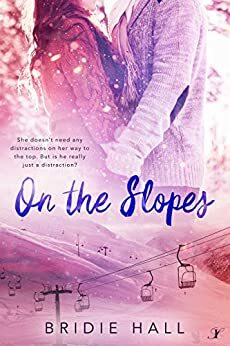 With winter just around the corner, I couldn’t wait to tear into On the Slopes by Bridie Hall, and it did not disappoint. You see, I love snow and winter sports, throw in a strong willed female protagonist with the hint of a possible romance snuggled up by the fire and you’ll have me ski beanie, chairlift, and all. But don’t worry if you aren’t a fan of the cold or the snow, Hall steams up the pages of the book just enough to keep you warm for weeks. Charlise, Charlie to her friends, belongs to an elite group of snowboarders touring Europe. During the last remaining days of a filming expedition, Charlie along with Sam and the other pro snowboarders will pack up and head to the next mountain. Most of the male boarders are caught up in the adrenaline of the sport and the after party. Sam’s different. He often follows his older and rowdier teammates, but there’s something about him that Charlie finds attractive. Maybe it’s his approach on the mountain. Maybe it’s his approach to life, but one things for sure, life on the slopes is about to get a lot more interesting.